"Because you never get a second chance to make a first impression". So goes the tagline for a 1980s anti-dandruff shampoo commercial. It's catchy, and the smiling faces lend credence to the assertion, but I'm not sure it's true. Well, I guess it's technically true, but the idea that first impressions become permanent opinions is flawed. When J.D. Salinger's "The Catcher in the Rye" was released, critics panned the novel for its use of "vulgar language", for undermining "family values", and for its "promotion of blasphemy and promiscuity." Despite the criticisms (or perhaps because of them) readers embraced the novel. Holden Caulfield became iconic of teenage rebellion, of a struggle for identity in a world where "traditional" values were shifting. I mean, Elvis Presley was singing (stealing?) black music on television and gyrating his hips ! Ach du lieber !! Won't someone think of the children ??!! Despite criticism, despite being banned or censored for "being a communist plot" (really! ), "The Catcher in the Rye" endures and has sold more than 65 million copies. That's more than "Twilight" !! With all of this talk of censorship and mystique surrounding the book, you'd think I would have been thrilled to read it. But my first impression of the book when I read it as a teenager (in the mid-1990s) was disappointment. It wasn't bad, but it didn't live up to the talk surrounding it. At least, not to my 16 year old brain. I'm not sure how apt my literary sensibilities were at the time. Things have changed somewhat in the intervening years. I have read Salinger's classic a few more times and I've gained an appreciation for its importance to the modern American literary canon. It's still not my favourite American novel, but I like it more than I did at first. My experience with Maker's Mark, the ubiquitous wheated bourbon, is similar to my experience with Holden Caulfield. What is a Wheated Bourbon? If you recall from my review of Four Roses Single Barrel, bourbon’s mash bill (mix of grains cooked and fermented together) must contain at least 51% corn in its mix. As bourbon ages, the corn notes tend to fade into a general sweetness. Barley is used for the enzymes it contains. These enzymes convert starches to sugar, which the yeast feeds on. While the barley adds some flavour to a bourbon, it’s primary used for fermentation purposes. Last but not least are the flavouring grains. Rye is used to add flavor to bourbons; it brings a unique spicy note to the whiskey and flavours of pepper, clove, cinnamon and nutmeg. Wheat is different. While not as bold as rye, wheat allows more of the corn's sweetness, as well as vanilla (and often coconut) notes from the barrel to come through. So a wheated bourbon (or wheater bourbon) still contains at least 51% corn, but the balance is divided between barley and wheat. Sometimes, both wheat and rye are used for flavouring, but it's usually one or the other. 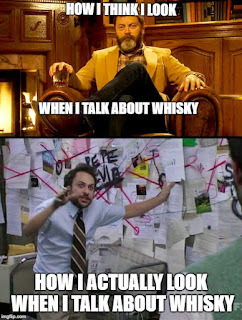 The following is from the Master of Malt website. Maker’s Mark began with the Samuels family. In 1783, Robert Samuels began to distil whiskey for personal consumption. The operations continued down the generations until a commercial distillery was eventually established. This was sold by T W Samuels during the mid twentieth century. He then founded a smaller distillery in Loretto, Kentucky and focussed on creating an artisan product, distilling far less, but with a greatly increased quality. It was decided that a new mashbill was required, rather than going through the costly and time consuming process of distilling varying recipes, Samuels chose to bake loaves of bread with differing proportions of grain. The finest tasting loaf was chosen; a loaf with a high barley and red winter wheat content and no rye. It was Bill Samuels Sr who destroyed the ancient family recipe and in 1958, the first bottles of Marker’s Mark were sold. 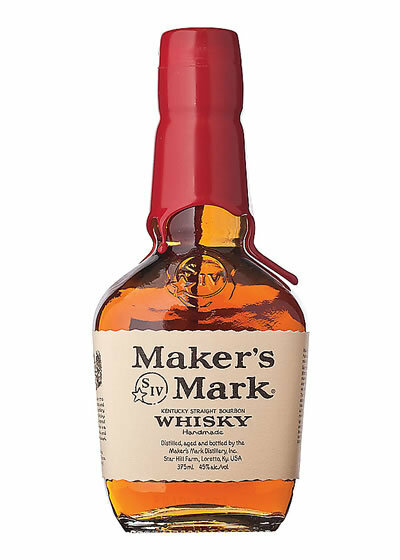 There are no age statements on the wax dipped bottles, for Maker’s Mark is not bottled by age, but by taste, when the Master Distiller deems it ready for general consumption. Each bottle is emblazoned with the letters SIV, the ‘S’ stands for Samuels and ‘IV’ is four in Roman numerals, honouring the creator, in the fourth generation of the family. There is also a star on the logo, a reference to Star Hill, the location of the distillery. Baking loaves of bread seems odd to me, as bread and whisky are usually consumed under different circumstances and with different goals in mind. But it seems to have worked. Maker's Mark is one of the world's best-known and best-selling bourbons.